In their November 2010 issue, Healthcare Design Magazine published an article entitled, “Too Noisy to Heal,” written by Dr. Erica Ryherd of the Georgia Institute of Technology. Dr. Ryherd lays out a clear case for the importance of acoustical design in healthcare facilities. 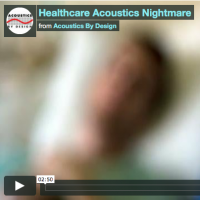 She uses the term “soundscape” because healthcare acoustical consulting is so much more than just reducing unwanted noise. At Acoustics By Design, we couldn’t agree more. There are several significant reasons why the acoustical environment in many healthcare settings is so poor. The most important factor is that the solution requires a fundamental and systematic understanding of the problems and the potential solutions. For the first time ever, the most significant areas of concern have been outlined in the new FGI Guidelines for the Design and Construction of Health Care Facilities, which sets objective standards for healthcare acoustics that designers are now required to meet. Identify and map the tasks that are dependent on the sound environment: meds administration; patient-family-caregiver communication; care team communication; sleep and healing by patients; performance, respite, and recovery by staff, etc. Assess the current soundscape for these tasks under different conditions, at different times, and different days of the week. Identify opportunities to control noise or reduce noise sources, add absorbent materials, or other acoustic modifications. Complete the construction or renovation. We encourage you to Read the full article here. At Acoustics By Design, we have been acoustical consultants for healthcare projects for many years. We specialize in the acoustical design of healthcare facilities, and we encourage you to watch the video of Lakeland Healthcare to hear about the many benefits directly from a Healthcare CEO.